Contrary to initial reports from FiveOuncesOfPain.com, M-1 Global representatives state that a light heavyweight bout between Dream Middleweight Grand Prix champion Gegard Mousasi and UFC fallout Rameau Thierry Sokoudjou for a Dream.9 fight are still in the preliminary stages of negotiations. Mousasi’s manager, Apy Echteld, confirmed the bout with FiveOuncesOfPain on Friday. There must have been some miscommunication after he and Dream/M-1 Global representatives pushed away from the bargaining table as the fight is far from a done deal. Mousasi competed on K-1 and Dream’s co-promoted K-1 DYNAMITE!! 2008 back on New Year’s Eve. He TKO’d Musashi in the 1stRound of their kickboxing bout. Mousasi’s last mixed martial arts tussle came in September when he put Ronaldo “Jacare” de Souza to sleep in the 1stRound of the Middleweight Grand Prix final. 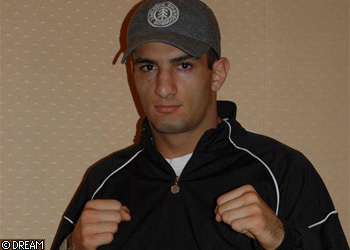 With the W, Mousasi became the organization’s first-ever middleweight champion. After an exciting start to his MMA career, Sokoudjou has dropped three of his last four scraps, en route to getting fired from the UFC. The African Assassin hopes that a return to Japan, where he experienced the best period of his MMA career, will help get things back on track. Although talks for the bout have stalled, it does not mean that the two sides won’t close the deal in time to make the May 26th fight date.